For one person out there, this post will present a little surprise. 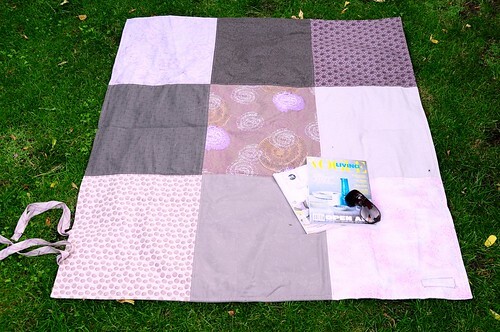 I made this patchwork picnic blanket as a gift for my friend Marie Beath. Surprise!! MB loves to picnic and is most deserving of a special blanket for which to do this on. Also, perhaps it would be good for outdoor re-readings of Harry Potter or Twilight novels? 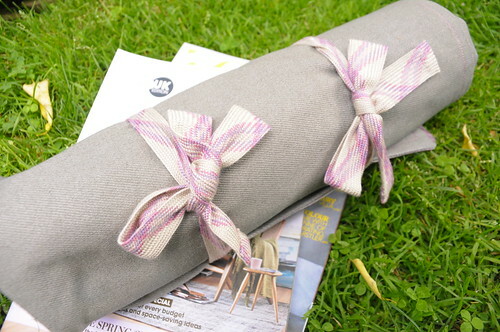 The inspiration for the colours of this blanket came from some amazing ‘ribbon’/shoestring from Mokuba with all lovely shades of purple and grey. In fact, I bought three different colour ways of this awesome stuff and plan to make two more picnic blankets for two other girlfriends. This is a seriously fun gift to make. Lastly, my newly standard label. 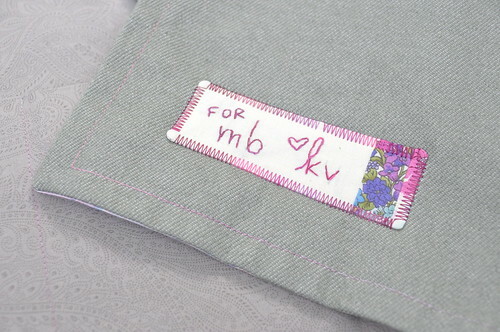 A tiny bit of patchwork attached to a hand embroidered label. I think I’ve actually turned making the label into a fun activity! MB – let’s get together soon for a picnic and I’ll bring your blanket! Oooohhhh thanks for this post, I’m inspired to get my picnic blanket session started. I love your colour palette. And how I miss Mokuba… I have to order Mokuba wholesale here in Germany, bah. love it! I’ve been obsessed with purple-gray for a while now. I need to make a quilt like that, perfect. You’re such a sweet friend! This is an amazing gift. 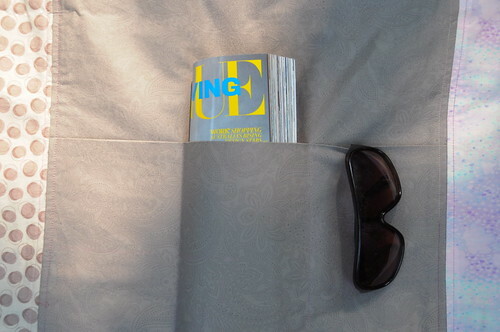 Such an ingenious design — I think I want to make one. I am downloading your class calendar right now! SO cute, I can’t wait for you to offer the class again! WHAAAATTTT??!?!?!?!? Really? for me? i am truly surprised, tickled and excited! i am blushing and gushing…wheeeeee! love the color combination and the little label. you always put so much effort in your things. love that. It’s the best picnic blanket project I’ve found! Beautiful work!